All pretense is gone, even on the part of the Antichrist, as the planet hurtles toward Armageddon and the ultimate showdown between good and evil. Book 10 in the Left Behind end-times thriller series, by Time LaHaye and Jerry B. Jenkins. On the brink of Armageddon. Global Community Supreme Potentate Nicolae Carpathia has his oldest and newest enemies right where he wants them: massed at Petra, a million strong — within reach of two bombs and a missile no one could survive without a miracle. Meanwhile, the newest adjunct member of the Tribulation Force remains a hostage of an unlikely band of Greeks who have already murdered at least three underground Judah-ites. Mac McCullum, Chloe Steele Williams, and Hannah Palemoon resolve to rescue Sebastian at all cost — but they can’t imagine how steep that cost will be. The earth, now a wasted shell of its former beauty, staggers under the weight of worsening judgments from heaven, while Carpathia turns up the heat on Christ followers, Jews, Muslims, and anyone else who does not swear total allegiance to him. The Trib Force’s aliases and even their Strong tower safe house have been compromised, forcing Rayford Steele, Buck Williams, and all members to flee for their lives while trying to maintain their overt opposition to Antichrist. Spiritual mentor Tsion Ben-Judah maintains that despite the severe judgments, this entire dark period of travail is as much a sign of God’s grace and mercy as it is of his wrath. Only miraculous interventions by heavenly forces around the world give the believers a prayer against the relentless onslaught of Global Community Peacekeeping and Morale Monitor forces. All pretense is gone, even on the part of the Antichrist, as the planet hurtles toward Armageddon and the ultimate showdown between good and evil. 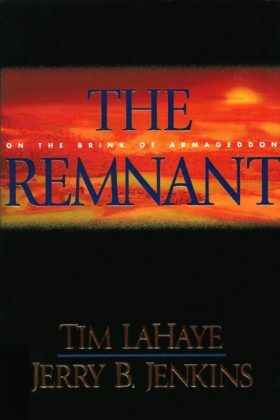 Book 10 in the Left Behind end-times thriller series, by Time LaHaye and Jerry B. Jenkins.